Welcome to the Wasilla Main Street Rehabilitation project website! 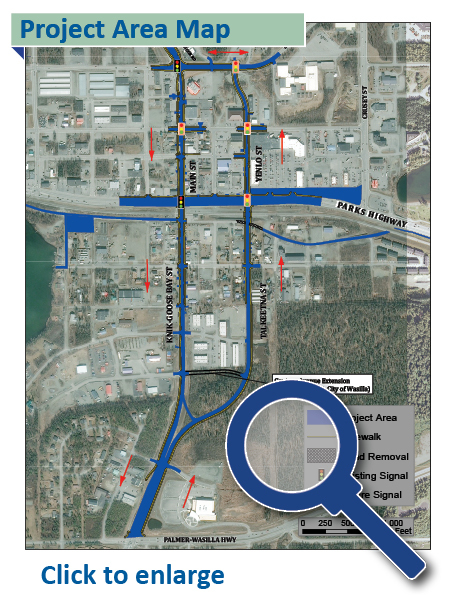 The Alaska Department of Transportation and Public Facilities (DOT&PF), in cooperation with the Federal Highway Administration (FHWA), is planning to rehabilitate Main Street and nearby roadways in downtown Wasilla. FHWA approved the Final Environmental Assessment and signed a Finding of No Significant Impact (FONSI) in December 2013. DOT&PF is now in the design phase of the project. Visit the Project Overview page to read more about the project.